This book describes how to project Caché objects to XML and how to control that projection to XML elements, attributes, and types. For information on XML standards supported in Caché, see Standards Supported by Caché in Using Caché XML Tools. Controlling the details of how the Caché class is mapped to an XML schema. Import XML documents into Caché, which creates new instances of that class, which you can then save. Generate XML schemas. Caché implicitly defines an XML type for the class and uses that for validation when using objects of that class in any of the preceding ways. Caché provides additional tools for working with XML documents, including arbitrary XML documents that do not correspond to Caché classes. These tools include support for DOM, XPath, and XSLT. Caché uses the Caché SAX Parser to validate and parse inbound and outbound XML documents (SAX means Simple API for XML). The Caché SAX Parser is a built-in SAX XML validating parser using the standard Xerces library. Caché SAX communicates with a Caché process using a high-performance, in-process call-in mechanism. You can fine-tune the parser or provide your own custom SAX interface classes. For information on using any of the XML tools described here, see Using Caché XML Tools. For information on web services and clients, see Creating Web Services and Web Clients in Caché. 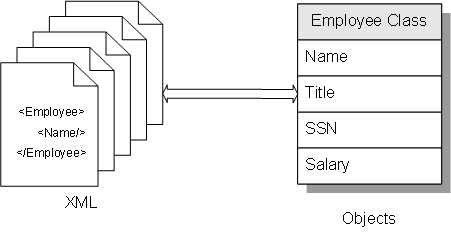 As the contents of an XData block in a class definition. See XData Blocks in Using Caché Objects.